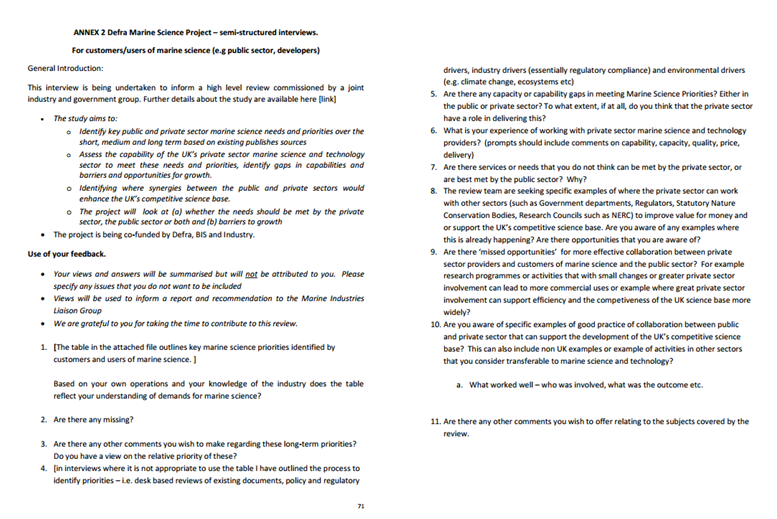 DEFRA report shows the massive pressure that is being put on UK marine science by commercial interests: from setting the research agenda, to running public services for profit, and the desire to dismantle public bodies such as CEFAS and the Met Office. 1) That marine science research becomes focused on meeting economic needs, and that industrial and commercial interest groups are allowed to heavily influence the UK’s marine science research agenda. 2) A large-scale marketization of marine science, where private companies take over many existing public services, currently run by government agencies such as CEFAS and the Met office, and run them for profit. 3) That the roles of CEFAS and the Met office are drastically stripped back, essentially becoming nothing more than a kite-mark under which private companies operate and exploit overseas markets. 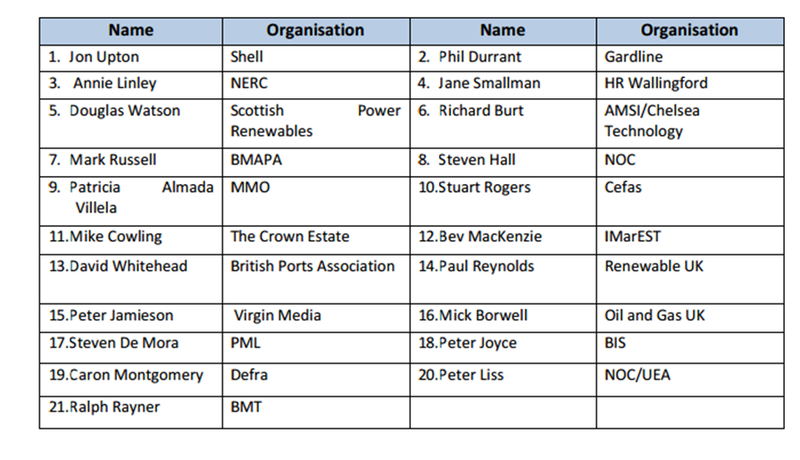 Table: The 21 “stakeholders” who took part in the “semi-informal interview”. Underneath is the questionnaire that these 21 people and 88 others (87.5 % from the private sector) were asked to fill out. If you were under any illusion that the priorities of industry may be aligned with wider societal needs, then the last quote demonstrates quite nicely why this isn’t the case: continued growth of the oil and gas sector is quite clearly not in society’s best interest! More broadly, as this recent article brilliantly points out in reference to a similar tactic being employed by the Canadian government, “basic scientific research is a vast endeavor, and some of it will pay off economically, and some won’t. In almost every case, you cannot know in advance which will do which.” The article uses the example of James Clerk Maxwell, whose curiosity about electricity and magnetism in the 19th century led to the foundation of our modern world. But wait, they hint that the public sector will still have a role in delivering those services where it is better placed to do so. What might those be exactly? Later on in the report there is a hint of what the public sector’s sole advantages may be: according to its survey, the public sector is viewed at being better at carrying out long-term research goals and blue-skies research. It is not surprising that industry should want others to carry out these roles, as it is these things that do not offer immediate profitable opportunities (only long-term social and economic benefits) and are therefore of no interest to the vast majority of the commercial world where people are only incentivised to think a few years ahead… at the most. Yet it is these important roles that are being threatened by the suggestions in this report (The UK science budget is currently frozen, so any increase in applied research WILL come at the expense of basic research). “There is concern within the marine science and technology commercial sector that CEFAS and other public bodies are believed to be competing for commercial business on uneven terms to the private sector. There are also concerns that agencies are not reflecting their full costs in their pricing. I had to read this a few times because I was shocked that the real agenda would be stated so explicitly. The commercial sector wishes for respectable public bodies such as CEFAS and the Met Office to become merely a kite-mark under which private companies operate (much as has happened with the NHS recently): under this system CEFAS, for example, would be nothing more than an administrator doling out lucrative contracts to private companies, and helping them to covertly gain access to foreign markets by using their highly regarded reputation to gain a foot-hold. This is essentially what has happened to UK marine science since the Tories came to power (In 2010 David Cameron spelled out his priorities for government which were to use, “all available policy levers,” to make it easier for the private sector to “create a new economic dynamism”). Under the guise of austerity, public research has suffered major cuts. Now, in the name of saving more money, the public sector is being rolled back to make way for commercial interests: seen in this light, recent NERC funding cuts were nothing more than a prelude to a massive ‘land grab’ by the private sector. It is unlikely that this new model will offer better value for tax payers’ money, will almost certainly be more expensive, and will lead to UK marine science focusing on commercial ventures that do not necessarily serve the long-term economic or social interests of the public. Even if you do not care about any of these things, if you are a scientist you have a selfish reason to care about these proposals: they will reduce the amount of academic freedom that you have (your research will be reduced to jumping through targeted research hoops set by business), and they will dramatically increase the cost of doing science. The latter point will mean that research grants are even harder to win, and academia will become even more competitive. If you look at the table of some of questioned 21 stakeholders, it really isn’t too difficult to see why some of them would be very happy with this situation.